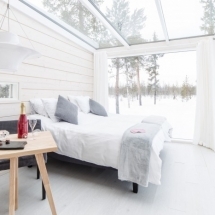 A home in the Finnish Forest, the Sky View cabins at the Northern Lights Ranch are the next generation of glass fronted accommodation. 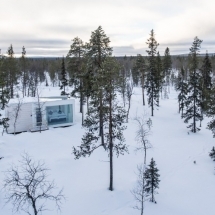 The compact Nordic pods are scattered in wintry wilderness and feature wide-angle views thanks to their glass walls and ceilings. 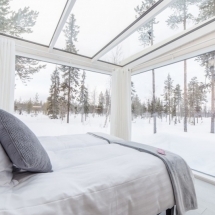 Enjoy a spectacular vantage point from the comfort of your bed bringing luxury Aurora viewing to the next level. 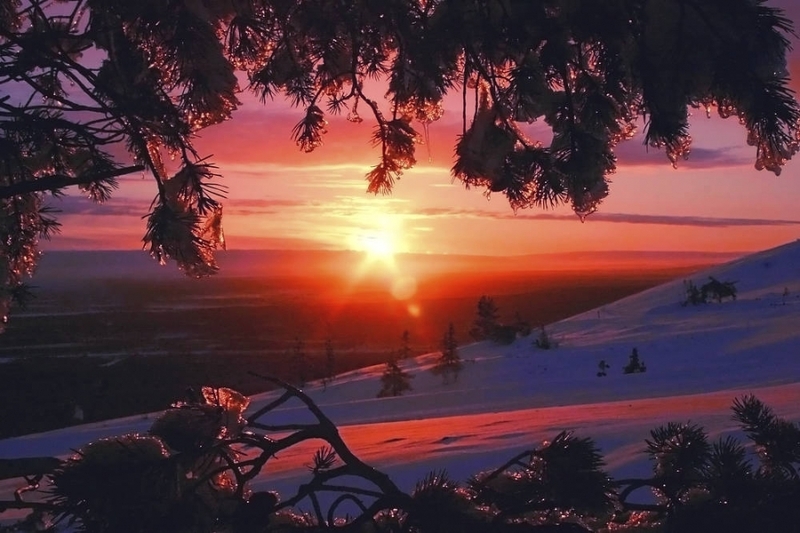 This three night break includes a deluxe Sky View Cabin complete with its own private outdoor hot tub to enjoy starry skies or Aurora colours. 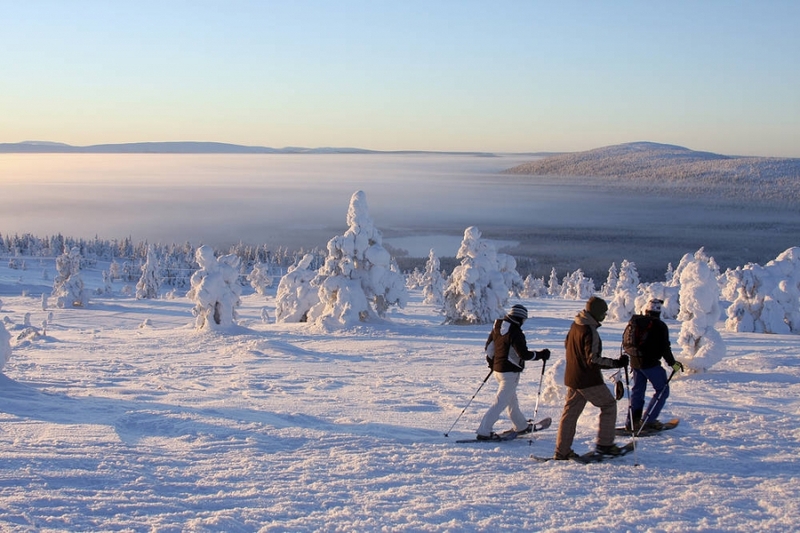 By day enjoy access to Finland’s most comprehensive downhill skiing resort at Levi as well as a handpicked selection of Arctic adventures tailored to your preferences. Arrival to Kittila Airport in Finnish Lapland. 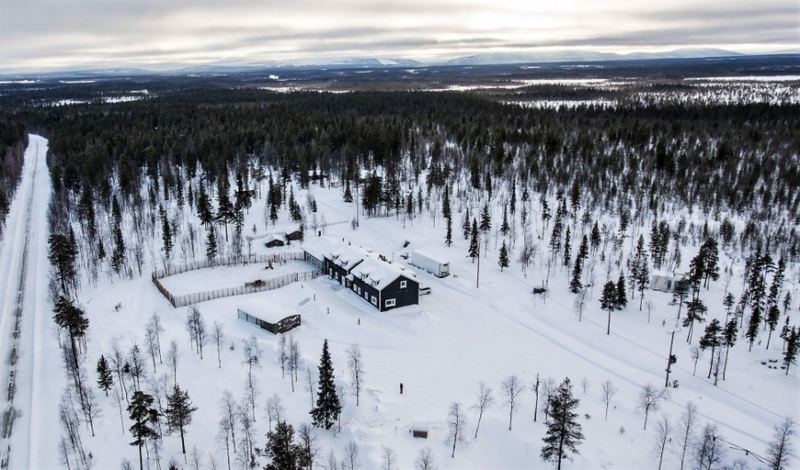 A driver will await your arrival flight and transfer you to your accommodation at the Northern Lights Ranch, a journey of around 30 minutes taking you deeper still into the forested landscapes of Arctic Finland. You’ll know you’ve arrived when you see the wooden chalet building of the Northern Lights Ranch. Your Sky View Cabin will be not far beyond it. Here you’ll settle in and relax. Enjoy your private outdoor hot tub. 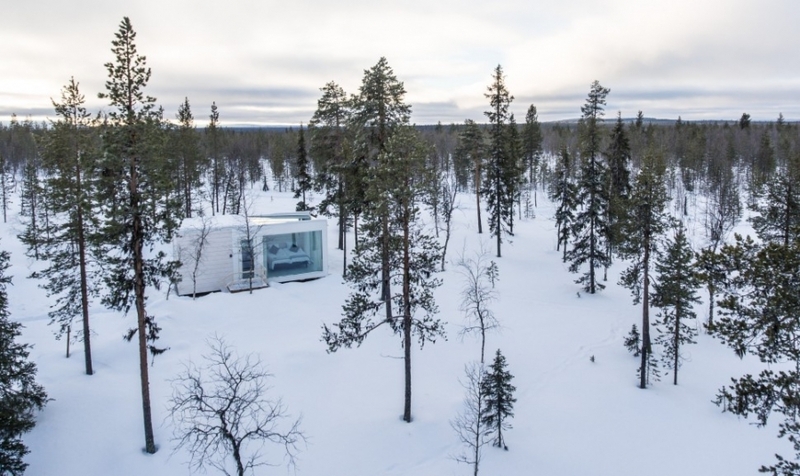 Dinner will be served in the ranch giving you fine flavours of the Arctic region. After dark, kick back and relax. Tilt your head skywards should any shades of colour enliven the night sky. 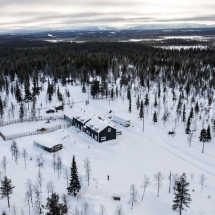 The Northern Lights Ranch features a luxury chalet for eight guests as well as a number of Sky View Cabins. 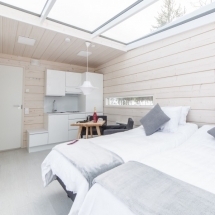 The Chalet has four double/twin en suite bedrooms and a fully equipped kitchen, dining room, a living room and a Finnish sauna. 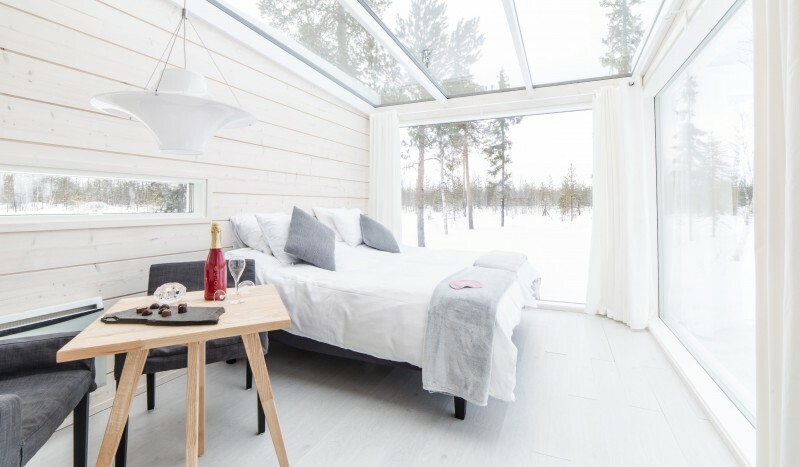 The individual Sky View Cabins are scattered in the land surrounding the chalet and feature glass walls and ceilings for optimum views of the night sky and surrounding wilderness. 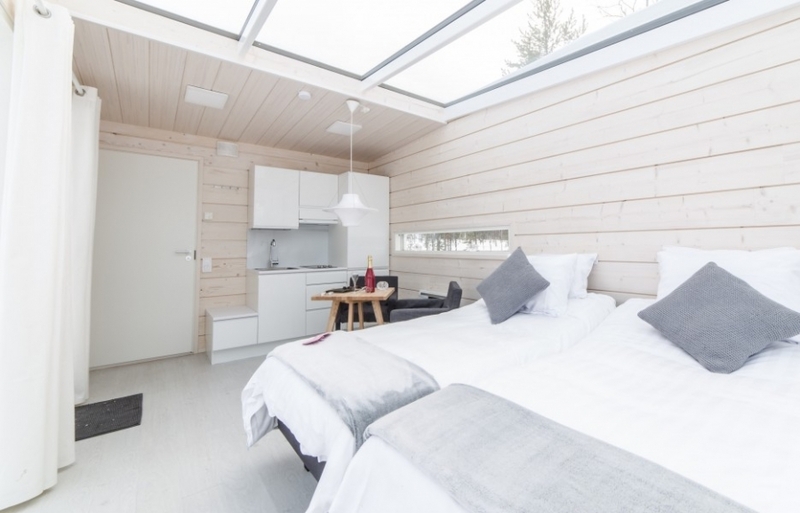 The cabins also include bathroom and kitchenette, and the deluxe Sky View Cabins include private outdoor hot tub. The Ranch has a restaurant on site serving breakfasts and dinners. Breakfast will be served before a day of adventure. 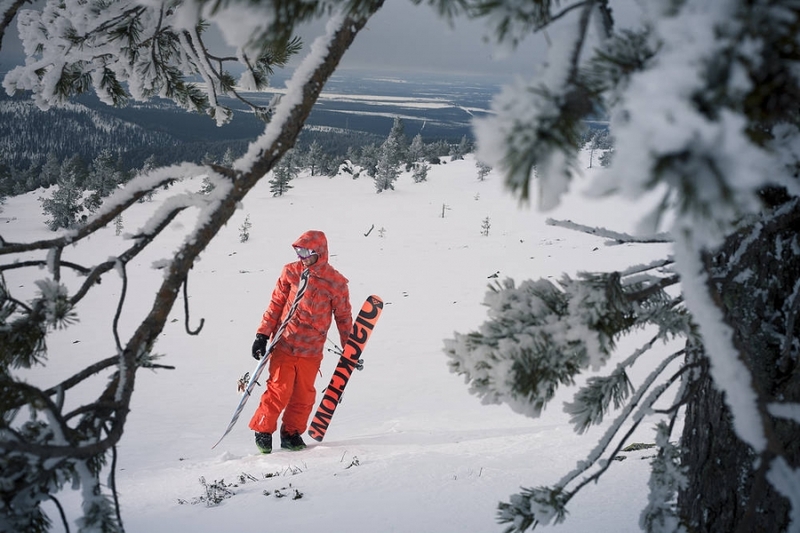 The lodge runs a free shuttle service to Levi Ski Resort twice daily to allow guests to enjoy a full day of downhill skiing or snow boarding. 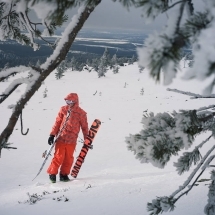 Levi Ski Resort is Finland’s largest downhill resort offering 43 pistes via 28 lifts. Ski rental, passes and ski school can all be pre-booked before your arrival. The resort offers family-friendly facilities with nursery slopes and child-friendly entertainment. 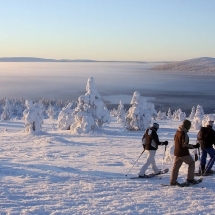 There are also 230km of cross-country ski trails to explore. 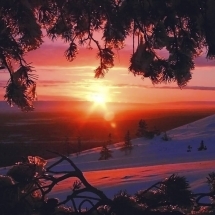 If you’d prefer to avoid the slopes, there are many optional excursions to choose from to tailor your stay. After breakfast, transfer to Kittila Airport in time for your departing flight. If you’re not ready to leave, we can extend your stay with extra nights and activities. 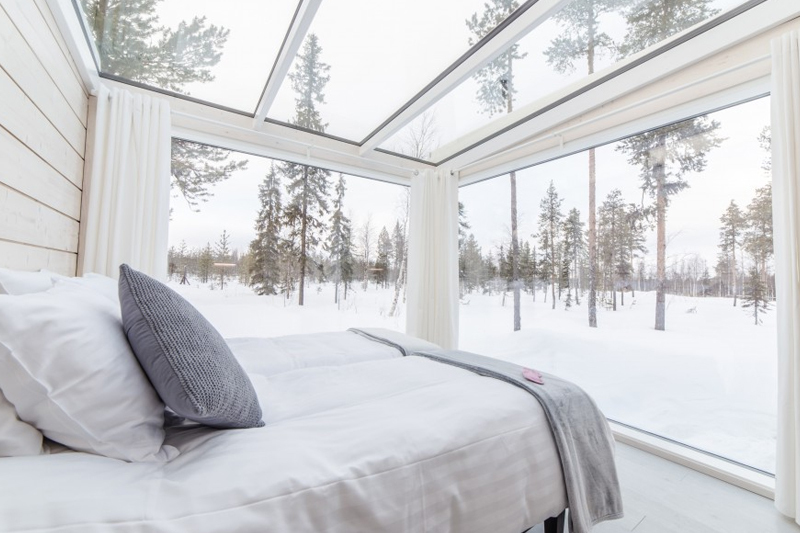 Alternatively why not round off your trip with a stay in an Ice Suite at the Snow Village for a memorable end to your holiday in Northern Finland. If you’re travelling in a small group, it is also possible to rent the luxurious Ranch Chalet adjacent to the restaurant for up to 8 guests.